Samsung Flat-panel TVs with 30 channels of HD programming. Easy-access Plug-and-Play feature makes it simple to connect electronics. 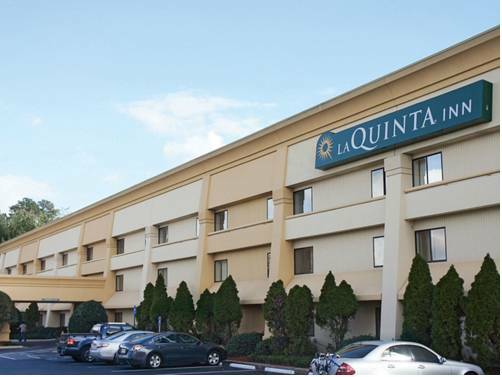 The La Quinta Inn Atlanta Midtown/Buckhead is conveniently located five miles north of downtown Atlanta with easy access to I-85 . There are several companies that are located very close to our hotel including Turner Broadcasting, CDC(Center for Disease Control and Prevention), Salvation Army, Home Depot, AT&T, and the Trane Company. From here, take the whole family to Centennial Olympic Park, Six Flags over Georgia, World of Coca Cola, the Georgia Aquarium, and Zoo Atlanta. You can also take an Inside CNN Studio Tours at the CNN Center. We are conveniently located to the Georgia Dome and Turner Field if you are in town to see the Falcons or Braves play. If you are in town to visit students, the campuses of Georgia Tech, Emory University, and Georgia State are all within 5 miles of our hotel. For some history of Atlanta, the Atlanta Cyclorama and Civil War Museum, Underground Atlanta, the Martin Luther King Jr. Center, and Carter Presidential Library are only a short drive away. If shopping is what you are in town for, we are close to the Lennox Square Mall and Phipps Plaza. In addition to great rates, the La Quinta Inn Atlanta Midtown/Buckhead has everything you need for a pleasant stay, including guest laundry facilities. All rooms feature free high-speed Internet access, a one cup coffee maker, hair dryer, iron/board, 32-inch flat screen HDTV's. Join us for a Free Bright Side Breakfast every morning with made-to-order waffles and other tasty items. Down the street from corner of I85 and Cheshire Bridge Rd.